One of the sorriest British defence procurement stories of recent times - which means a very sorry story indeed - finally approached resolution this week. The Ministry of Defence (MoD) has announced that it will modify eight large helicopters it has had since 2001 so that they can actually be used. You read that right: even though British troops fighting in Iraq and Afghanistan are crying out for helicopter lift, eight big brand-new choppers have been sitting in storage in the UK, grounded by MoD idiocy, for six years. What our boys and girls really want for Christmas. This is, as those readers who follow the military news will know, the story of the ill-fated Chinook HC3 model. The tale began in 1995, when the UK ordered 14 Chinooks, paying £240m (equating to £20m per bird in today's money). Six of these were normal UK-pattern HC2s, the best, cheapest, most powerful and most reliable helicopters in British service. The other eight were the ill-fated HC3 variant, uniquely custom-modified to elaborate MoD requirements by the manufacturer, Boeing. The differences lay mostly in cockpit avionics. Boeing delivered the HC3s in accordance with the contract, at which point the MoD needed to certify them as safe to fly. (Military aircraft are dealt with by the MoD, not the civil authorities.) After scratching their heads for a while, the men from the ministry decided that their own specially-requested modifications meant that the helicopters could not be cleared for instrument flying. They could only fly under visual flight rules - in other words, only on lovely days, only in certain classes of airspace and steering well clear of any of those nasty clouds. The MoD people don't have any reason for saying that the HC3's instrument fit is unsafe; they merely say they can't prove it isn't. Understandably, when the Parliamentary public accounts committee looked into the matter, they said that the HC3 buy was "the most incompetent procurement of all time". It was also said that the MoD "might as well have bought eight turkeys". As a result of all this, the HC3s have been hangar queens in the UK since their delivery. During that time the British forces have plunged into two large overseas wars in which their lack of helicopter lift has been a massive ball and chain round their ankles. The MoD has attempted to suggest that the mess is somehow not their fault, saying that Boeing and the US government have not cooperated with them. Boeing have responded that the HC3s would not have a problem getting cleared for instrument flight in the US, that they were delivered exactly to the contract spec and that internal MoD madness isn't their problem. Now, at last, the ministry is moving to sort the issue out, announcing on Tuesday that a contract was signed with Boeing last week under which the HC3s will finally be made fit to fly. This will be done by converting them into HC2s, at a cost to the taxpayer of £90m. The work will actually be done by QinetiQ, the former MoD technical arm which was turned into a company in a process which greatly enriched the execs who took it out of government. Boeing, however, will take care of the necessary design, planning and parts. Helicopters play a vital role in supporting our operations in Iraq and Afghanistan. That is why we are taking measures to make more helicopters available to operations as quickly as possible. Well, duh. 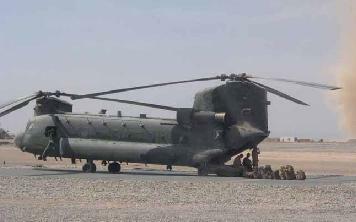 The Chinook in particular is the only lift chopper which is much use in Afghanistan, being the only one with enough spare grunt to carry useful loads in such hot, high-altitude conditions. However, this is scarcely "as quickly as possible". The government could have handed out this contract at any time in the last seven years; but it chose not to. Instead it has handed out much larger helicopter deals here in the UK - for instance a £1bn buy of small Lynx choppers, which can't carry much and won't be delivered until 2011. But the purchase saved 900 jobs, for a while anyway. Let's just finish this off with a thought from the family of Major Matthew Bacon, killed during an unnecessary road journey in Basra just over two years ago. Major Bacon's group had to go by road because a planned helicopter lift could not be provided. As a direct result he's dead and three more Brits are terribly injured, two of them losing limbs. Matthew was just 34 when he was murdered... He was just reaching his full potential and had everything to live for. His life was full of happiness... The real tragedy is that he had been booked to go on the regular helicopter flight between those two places... To us, his parents, his brother and his soul mate he was truly a hero. We cannot imagine how life can go on without him. Perhaps a lot of us UK taxpayers might wish that our boys and girls overseas were getting some new helicopters for Christmas this year, rather than the one after next. Anyway. Merry Christmas to any of ours out there who happen to be reading this. Some of us at least back here are sorry we don't look after you better.